London Docklands on its final approach to Heathrow. A B.O.A.C. Comet 4 heads over the still bustling London Docklands on its final approach to Heathrow. A new generation of traveler would soon take for granted the huge leaps forward that civil aviation had taken in the short time since the Second World War. 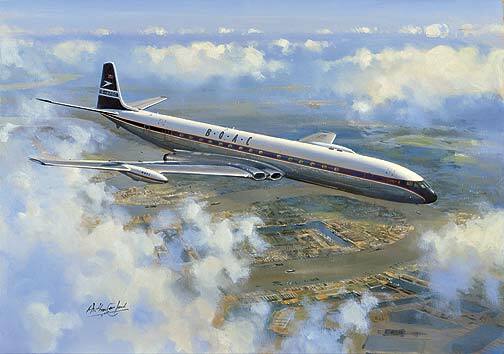 A truly special tribute to this splendid aircraft this fine art print is a limited edition of just 250 each signed and numbered by the artist Anthony Cowland G.Av.A.